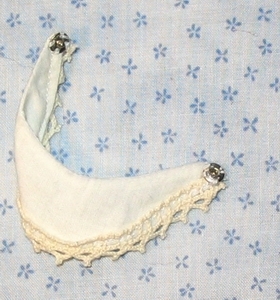 "...and the other was a pearl-gray silk, made in true Quaker fashion, with a fine white fichu crossed in front, lawn cap, and all..."
page 110, Hitty: Her First Hundred Years, by Rachel Field. 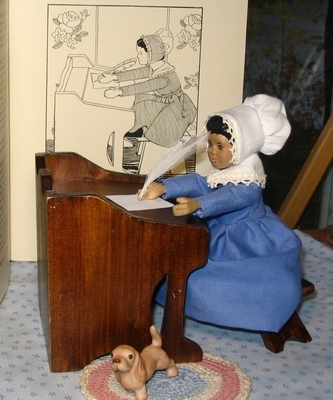 Hitty Petal at her desk, wearing the Quaker Outfit. around the neck, and down the back on the other side. Cut out, leaving a 1/8th inch seam allowance around the sewn part. Clip the curved seams. Turn right side out, and press. You may need to use a blunt object, such as a hemostat to push out the neck corners. Tip: never use scissors to push out corners. It will always punch through the fabric, leaving a hole. No need to ask how I know this. do as I did--I used No Sew, a soft, fast-drying 'glue' that holds the seam in place forever. I bought it for $2.99 at JoAnn Fabrics. The sleeves will fit right into the armhole, so merely pin in place, and sew slowly around the seam. Once sewn, clip the seam down evenly. If your fabric is the type to fray easily, you may want to consider using a Fray Check Product. 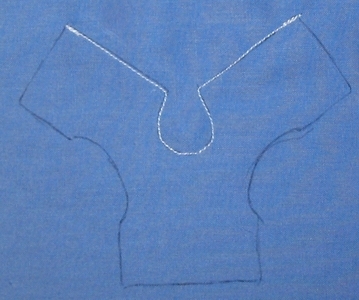 Once the sleeves are in place, Pin at the wrist, underarm seam, and bodice bottom seam, and sew the underarm seam. The Skirt--cut 4" x 10"
the center of the skirt should be pinned to the center of the bodice. 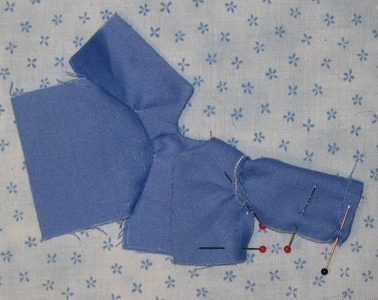 Fold over both short ends 1/4" and pin to the back bottom of the bodice. 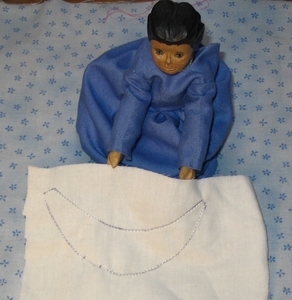 Now, pull your running stitch to create gathers, and move the gathers evenly across the bottom of the bodice. Tip: place pins every 1/2" to ensure no slippage of the fabric. Sew so slowly, you can see your needle move up and down. 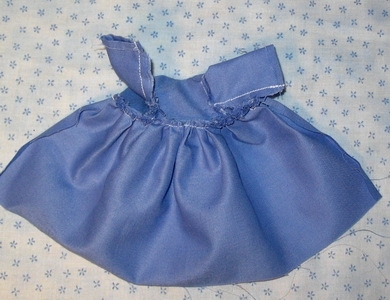 Sew with the gathers to the bottom, and the smooth bodice edge to the top. 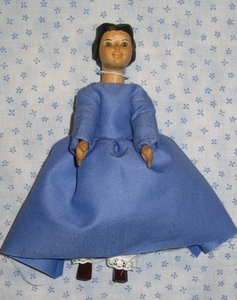 Turn the dress right side out, and try it on your model. Figure out where you want the hem to be. Once you have figured out the hem, fold it up and press. You can hand-sew, machine-sew, or use a No Sew product to secure the hem. you will begin sewing. When you sewed the skirt to the bodice, you were supposed to fold over 1/4". This should remain folded over. 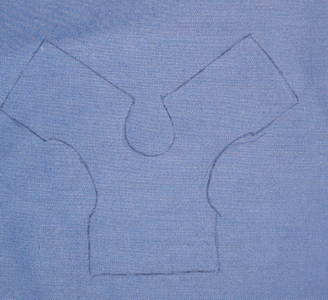 As you go down the skirt, you can open this fold (as shown). Tip: double-stitch at hem and top to avoid having the seam come undone. 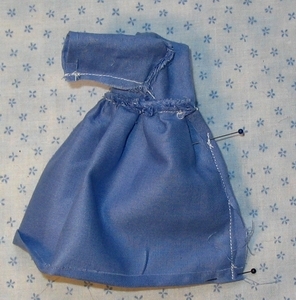 Sew a button on one side of the bodice back, and make a loop from elastic on the other side. Or--you can always use a snap. 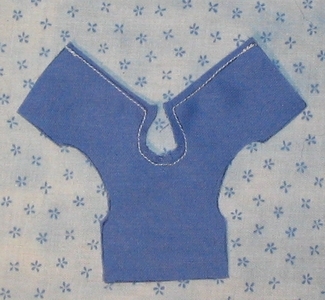 Cut out, with a 1/8th inch seam. Turn right side out, and press. 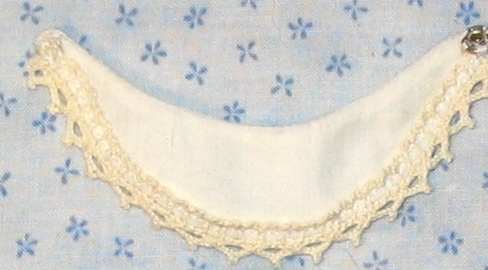 To add the lace, simply sew it around the outside edge by hand or machine. and on the under part of the other end. 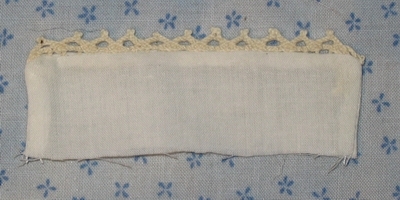 Cut out the brim at 3 1/2" x 1 1/4" (cut two) and layer as shown, with the lace in the center. 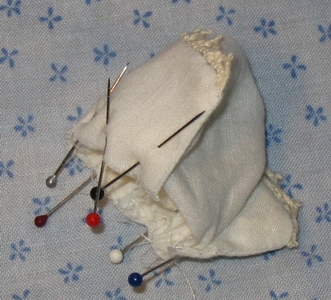 Pin securely, and sew up the short end, across the pinned part, and down the other short end. Turn right side out, and press. and then tack it down with a small running stitch. 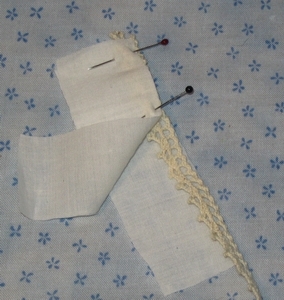 Gather the round part of the bonnet with a running stitch, but do not gather the square part you just hemmed. Pin the brim as shown, to the bonnet. 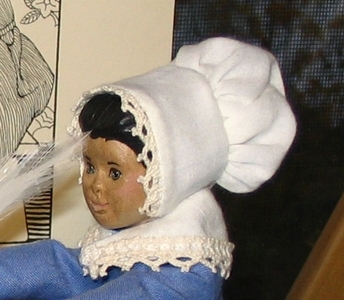 Note that you do not pin or sew the brim over the hemmed part of the bonnet back. You can attach ribbon to tie this on, but I used a piece of plastic elastic (beading elastic) instead, as it just looked neater than a ribbon. Have fun! 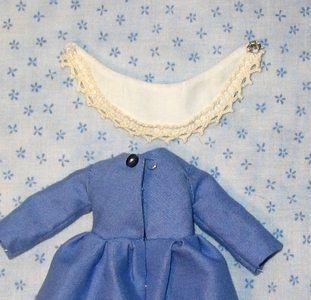 Send us pictures of your completed Quaker outfit, and visit our gallery.